We are Paul and Olivia Leary, the owner/breeders and pack leaders of Fair Wind Shilohs. Originally from New England, we are now located in the beautifully scenic town of Beaufort, North Carolina. While the kids (the human kids) were growing up we rescued a few German Shepherd mixes from local shelters. It was after our last mixed shepherd passed over the rainbow bridge and we contemplated getting another, that our research turned us in the direction of the Shiloh Shepherd breed. However, it wasn’t until 2006 when we rescued our first Shiloh, Bella, from Pennsylvania that we knew we had found the breed we always wanted to have in our lives. 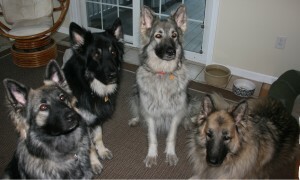 Shiloh Shepherds are wonderful family companions. These gentle loving large dogs are dedicated, loyal and wonderful additions to home and family. They love and enjoy interacting with all the members of their pack, including humans of all ages – even cats! They are highly intelligent and have wonderful temperaments. They relish affection and will bring you years of entertainment and companionship. We have raised Shilohs for about 10 years, and fall more in love with them every day. We believe strongly in ethical breeding, and extensive health testing for our breeding dogs. As we produce some of these tremendous animals we look forward to sharing these dogs with you if you are a good fit for one. If you are interested in adding a new family member, please feel free to contact us with any questions. Below is a copy of a document we found and we have adopted it as “Our Breeder’s Creed” with thanks to Heather Andelin for creating this beautiful letter. This says it all and is an important read for any past, present or future puppy owner. There were hours upon hours spent researching lines for the parents of your puppies. Going over breeder after breeder, choosing not only my pet but looking for a dog that will make you your pet. Worrying if you’d be happy, if I had chosen correctly and your puppy would grow up healthy and happy. Going over puppy after puppy with fellow breeders, running over my program with as many knowledgeable breeders as I can, determined to not miss anything. Tracing lines back as far as I could, learning the ins and outs not only for my knowledge but so that I was informed, prepared to go over every detail with you, to answer the questions that sometimes you don’t even ask. Then there’s years of watching your puppies parents grow. Loving them and enjoying them as part of my family. Taking them every where I can, training them, socializing them, watching how they fill out. Asking myself I had made the right choice in both of them. Scrutinizing their confirmation, how they move, and their temperament. There was the stress of health testing. Praying not only that my babies were healthy but that they had the genes to make your baby healthy. Finally came the time to put your puppies parents together. For the next 63 days I worried, I obsessed, I grew excited. I watched your puppies mom like a hawk. Making sure my baby was ok, monitoring her diet better than I do my own. Concerned that she was getting enough of the right nutrients and that your growing baby was getting the best start possible. I spent hours on the couch, floor, and dog bed with her watching her tummy grow and anxiously waiting. As your baby and mine grew I laid my hands on her tummy and felt the first movements of your puppy. As the time grew close I spent most nights in the nursery with her. Making sure she didn’t go into labor without me knowing, in case something went wrong and one of our babies needed help. When labor started my whole life stopped. I spent every second with her. Your baby was born into my hands and I held my breath as I cleaned them up, watching for movement and breathing, cleaning them up, checking them over, and wondering if you’d love them as much as I already did. I helped your babies brother when mom got tired and he was stuck. I cried when your babies sister didn’t make it. I searched for you and interviewed you. As you spoke I tried to read your character. Would you love them as much as I do? Would you bring them in as part of your family? Would you care for this tiny life that I brought into this world that I am responsible for? Some of you were turned away but some of you were welcomed into our family. The day you took your baby home was harder than I’d ever let on. I was excited for you but I was also terrified. Had I chosen correctly? Were you who you seemed to be? My love and worry didn’t end there. I thought about your baby regularly, saddened when I didn’t get updates, ecstatic when I did. I hoped you were caring for your baby the way I care for mine. I answered your questions happily and answered them again just as happily to your babies siblings new parents. When your puppies sister ate a couch I stayed up that night she was at the vets, waiting to hear that she was ok. When their brothers parents decided he no longer fit in their life I welcomed him home, sorry that I had chosen wrong for him and promised him it wouldn’t happen again.